In the very popular Digital Banking Reports entitled, Digital Account Opening and Guide to Multichannel Onboarding in Banking, in-depth analysis of the keys to developing successful digital account opening and multichannel onboarding solutions are provided. Leveraging years of experience from “best-in-class” organizations, these reports have become the industry’s most respected tools for organizations hoping to improve the early stages of the customer journey. Despite these comprehensive guidebooks, a survey of financial organizations worldwide indicates that the banking industry continues to fail at supporting the account opening stage of the digital customer journey. The research also provides evidence that there are lost opportunities in growing a new and existing relationship using digital channels. In the most comprehensive research study of its kind, sponsored by Kofax, financial institutions were asked to provide a progress report on their ability to open a new account online or with a mobile device, as well as indicate how well they can onboard new customers and cross-sell digitally. The results of the research do not paint a promising picture. 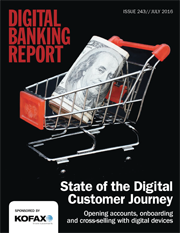 The 75-page Digital Banking Report, ‘State of the Digital Customer Journey,’ shows evidence that banks and credit unions of all sizes and not prepared to combat the increasing encroachment by fintech start-ups that focus on making every stage of the customer journey easy, seamless and contextual. In fact, there are some segments of the industry that are falling significantly behind consumer expectations. 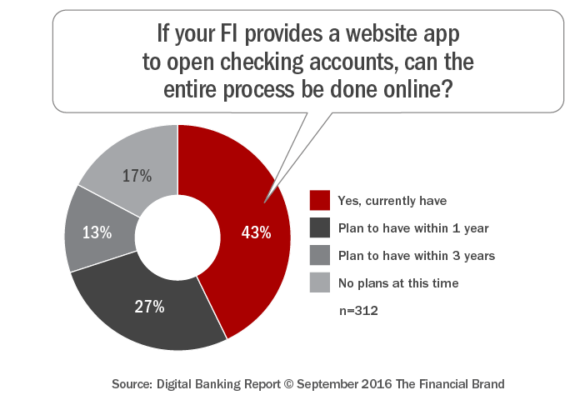 The vast majority of financial institutions can’t open a new account entirely online or on a mobile device. The vast majority of financial institutions surveyed do not offer a consistent digitalization of any given process, with many engagements that begin on a digital channel requiring either a manual or in-person interaction to complete. To improve the consumer experience and realize the revenue, cost, and operational benefits of complete digitization, banks and credit unions must adopt consumer-centric design practices, leverage advanced analytics and automation, and transcend silos. The consumer wants a simple and seamless digital experience. If this can be achieved, it will be reflected in improved satisfaction, loyalty and referral scores. If the digital consumer does not experience a positive end-to-end digital process, new account opening abandonment or existing relationship attrition is likely to occur. An increasingly important component of a digital customer journey is to apply ‘intelligent engagement’ through advanced analytics. This is not only table stakes in the ability to acquire and serve customers, it is the differentiation that many fintech firms tout in the marketplace. It is no longer a matter of whether digitalization of the customer journey in banking is needed. Digital consumers are already demanding this level of engagement and are moving relationships based on an organization’s ability to meet their expectations easily and in real-time. The value to banks and credit unions goes beyond customer satisfaction, to include opportunities for cost reductions, revenue enhancements and risk management. The results of our research indicate that the digital account opening process offered by the majority of financial institutions doesn’t align with most consumers’ expectations. Not only did we find that the majority of banks and credit unions do not provide an online or mobile new account opening option, we found that even those that do provide this option require non-digital engagement to complete the process. 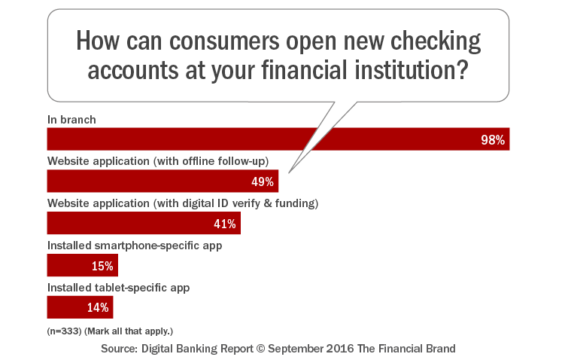 When we asked financial institutions how consumers could open new checking accounts, slightly less than half indicated they could open accounts online, while only 15% of organizations could initiate the account opening process with a mobile device. As might be expected, the largest firms surveyed were roughly twice as likely to be able to support mobile account opening. In our survey, less than half of the institutions surveyed (43%) indicated that the entire online account opening can be done without coming into the branch. The lack of commitment to being genuinely a Digital Bank becomes apparent when we found that almost three-quarters of financial institutions require key Know Your Customer (KYC) components to be done in the branch (signatures, ID verification). When the results were analyzed based on size and type of organization, only the very largest organizations and credit unions performed better than the norm regarding the ability to complete the account opening process online (56% and 54% respectively). Not surprisingly, most firms can not support a “save and resume” functionality. Our research of the online account opening process by financial institutions also provides insights into the scope of multichannel support. an analysis of abandonment rates, and whether other accounts (besides checking) can be opened on an onlinee app. Much of this analysis includes cross-tabs for size and type of organization. While many financial institutions have tried to move some portion of their account opening process to mobile devices, the reality is that most processes are confusing, tedious, and a lot of work for customers to complete. As with any mobile process, every keystroke and every time a consumer must exert extra effort that takes them away from the smartphone, contributes to abandonment. To succeed, banks and credit unions need to minimize these hurdles in order to create a mobile new account process that is optimized and frictionless. The number of financial institutions that responded that they allow checking account opening with a mobile device (17%) was far lower than those who said they offered online account opening (43%). Given the significant movement of all banking and non-banking transactions to mobile devices, it is both surprising and concerning that the number of organizations indicating that there are no plans to offer mobile account opening via a mobile device (35%) is double those who provided the same response for online account opening. As we have seen in other parts of our research, the largest firms were more likely to support mobile account opening. In addition, credit unions are keeping pace with the largest financial institutions with mobile capabilities. 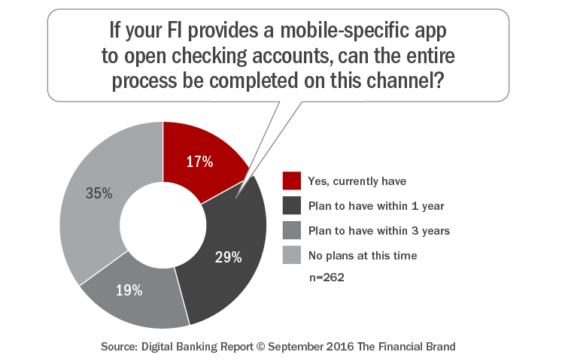 The fact that 47% of community banks indicated that they have no plans to offer mobile account opening is concerning to say the least. Our research of the mobile account opening process by financial institutions also provides insights into the ways to eliminate friction in the mobile account opening process, whether approval of a new mobile account is immediate, the scope of multichannel support. an analysis of abandonment rates, and whether other accounts (besides checking) can be opened on a mobile app. Much of this analysis includes cross-tabs for size and type of organization. 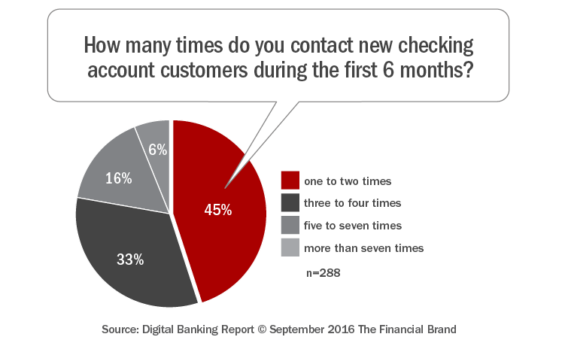 Banks have seen a steep decline in face-to-face interactions with customers and even prospective customers. How do you tackle customer onboarding for people who don’t visit your branches? If you don’t offer some form of digital onboarding, you better at least be building future strategies for the digital consumer. 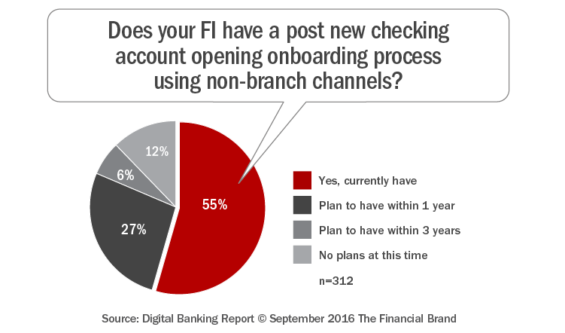 To set a benchmark, we asked survey respondents to indicate if they had a “structured” post new account opening process. Amazingly, despite all of the emphasis on the importance of onboarding in financial services, only 55% respondents indicated that they had such a program at their organization. When we asked about the most used communication channels used for the onboarding process, email was the most used channel (73%), followed by direct 1:1 communication (61%), direct mail (53%) and phone (52%). This channel usage is aligned with most studies we have done around effective onboarding, but does not reflect the “shift to digital” we would anticipate. Somewhat surprising is the very low usage of mobile ads, retargeting and SMS texts given the very personal and powerful effectiveness of these channels. While research from JD Power indicates the “optimal” number of communications during the initial 6 months of a new banking relationship should be 5-7 contacts, almost half of the institutions that have onboarding programs (45%) only connect with their new customers 1-2 times. 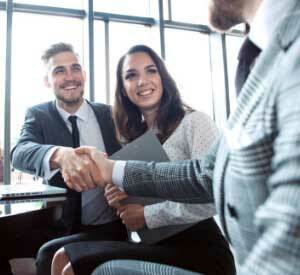 Only 22% of those organizations with an onboarding program connect with their new customers to the level that JD Power recommended. Our research of the onboarding process by financial institutions also provides insights into the most effective communication channels, services sold during onboarding, how offerings are selected, what other products have onboarding programs, the benchmarks for onboarding success and deep analysis around whether current onboarding is successful. Much of this analysis includes cross-tabs for size and type of organization. Financial services firms need to change their cross-selling strategies to align with the new digital reality. Leveraging expanded data insights and a customer-first positioning will enable a more compelling customer experience resulting in greater sales, loyalty and share of wallet. 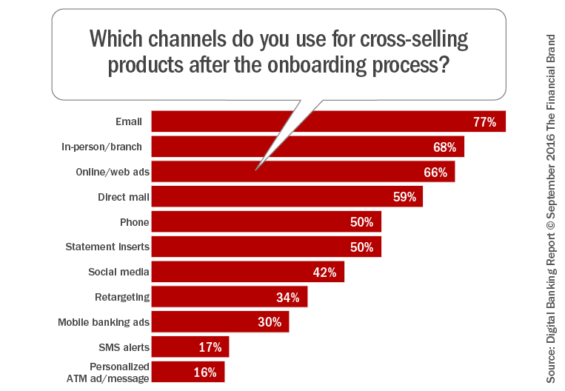 As with the onboarding process, email was the most used channel (77%) for cross-selling, with branch (in-person) contact (68%) and online/web ads (66%) being used heavily as well. While email is considered a ‘digital’ channel by some, other digital channels (social media, mobile banking app and SMS alerts) were used much less frequently. This is a missed opportunity. We did find variances in both channels used and services marketed by size and type of financial institution. For instance, we found that the largest organizations are more likely to use direct mail and digital channels (mobile banking ads, SMS alerts). Our research of the digital cross-selling process by financial institutions also provides insights into the most effective cross-sell channels, how offerings are selected, the benchmarks for cross-selling success and the level of personalization of offers, and deep analysis around whether current cross-selling efforts are successful. We also determined when ads within the mobile banking app appear (pre-login, post-login or post-transaction). Much of this analysis includes cross-tabs for size and type of organization. It is clear that there is a significant gap between what the digital consumer expects and what banks and credit unions are delivering during the entire customer journey. 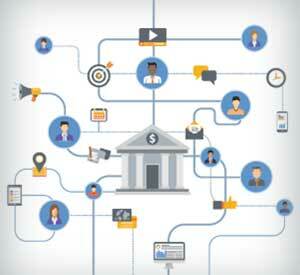 The relatively poor performance by the majority of traditional financial services organizations in delivering a customer-focused digital account opening, onboarding and cross-selling process is an opportunity for those institutions that want to embrace the potential to become a “Digital Bank”. The cost of technology and advanced analytic tools should not be a hurdle for most financial organizations and the digital marketing tools are also available to virtually any organization. The margin between opportunity and risk is narrowing, as more alternative financial services become available and the digital consumer becomes more demanding. The results from this research should provide motivation to many banks and credit unions to “up their game” and begin to deliver the seamless and contextual digital customer experience that is possible. The State of the Digital Customer Journey report, sponsored by Kofax, provides comprehensive insight into the minds of consumers and the activities of financial institutions around digital account opening, onboarding and cross-selling. The report includes the results of a survey more than 300 financial services organizations. The report includes 75 pages of analysis and 60 charts. This article was originally published on September 6, 2016 . All content © 2019 by The Financial Brand and may not be reproduced by any means without permission.